This is a center board to hold all the factories tiles in place during game play. It is a 15" diameter circle and is a 1/4" thick. It is made up of 2 layers of 1/8" mdf. 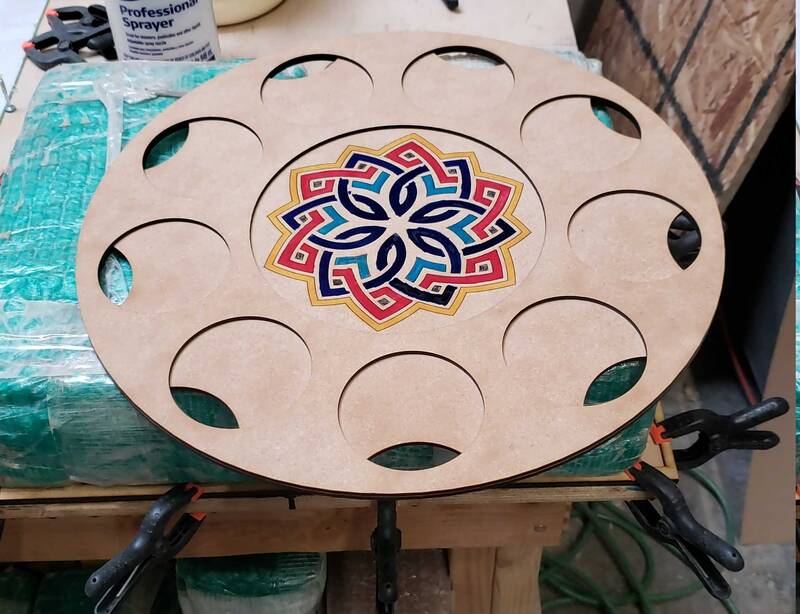 This version is a single 15" diameter circle with a design etched into the central part of the board so that you can paint it to add color to your game board. This one does not break down into smaller pieces and does not fit into the box. It comes sanded and assembled and ready for you to stain, paint or seal as you desire. We recommend that you at least seal it for maximum durability. It does not come painted. Picture is for reference only. Shipping is free in the USA. If you are outside the USA send us a message to get a quote. This does not come with a copy of either Azul game.